It was early on a Sunday morning when the hotel bus delivered me to Narita airport to begin my journey home. Somewhere beneath the alternating layers of tiredness and itchy anticipation of return was buried that sediment of antipathy towards air-flight that had been deposited, grain by noisy grain, during the two weeks on the farm. As I loaded my bags on a trolley, neat detachments of police in crisp light blue shirts and peaked caps made their way along the glass-walled exterior of the building. Although they were proceeding at some pace, their movements were not hurried and neither their young faces nor their shoulder muscles suggested any sense of tension. Perhaps these were cadets engaged in a drill and perhaps the water cannon down below the access ramp looked half a century old because it, too, was something only brought out for dress rehearsals. Moving through the automatic doors into the airport concourse to join my queue, I was again struck by how misjudged Auge’s idea of an “everywhere and nowhere” non-place seemed. Against his interpretation – and a similar one developed by Alain De Botton in “The Art of Travel” – this seemed, as I speculated back in my first post, to look, sound, smell and feel like an ‘accented’ space, one whose local inflections were willing to make themselves known to every part of the sensory register. Certainly, the acoustic atmosphere here was a very different one than I experienced at Charles De Gaulle outside Paris. Although glass, hard flooring and metal furniture were again present, in keeping with the more subdued colour palette that these were rendered in, the expanse of the concourse had fallen beneath a hush. This quietness was also there on the weekday afternoon when Rupert and I had come in search of a pharmacy. The soundscape might well be described as a soft one, where individual acoustic events – a holdall falling over, a mobile phone ringing – found their volume dissipated and their edges blunted. Considerably fewer public announcements were made and when they were I wasn’t left with the sense of a channel being left open to bleed out static. The shops, too, felt as if they had less need to express their presence aurally even if their more vivid signs, products and lighting interrupted the airport’s mellower hues of browns and greys and (upstairs) pinks. The contrast between this diffused and relaxed sonic ambience and the screaming, shrieking harshness that I had been listening to and recording over at Toho couldn’t be more marked. Finding a too long queue at the airport barber’s, I bought a weak coffee and walked out onto the external terrace on the Terminal One’s third floor. 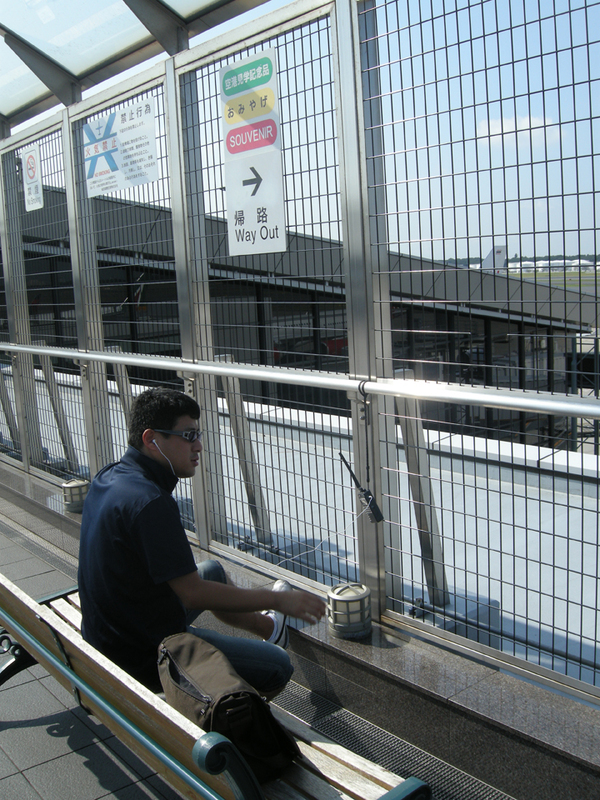 Sitting down on a bench, I noticed that quite a few people were using airband scanners to listen-in to the communications between pilots and air traffic control. I had been thinking about this technology as I walked around the farm and had wondered about these bursts of short-wave transmissions being exchanged over my head. Could some recordings of these have a role in “Air Pressure”? Part of me felt uneasy about drawing in material from outside the perimeter of what was audible in the study site. But I could also imagine using recordings as a way of suggesting the presence of aircraft without recourse to engine noise, blending the communications signals into the sounds of humans, animals, insects, foliage and weather. Used carefully, this could be a way of connecting the flights through their necessary communications with the tower on to the larger management of airspace, to the world from which the planes have flown (the ritual naming of different carriers and points of departure in the radio chatter) and to a human dimension that might be lost in the impersonal roar of engine noise. Whatever the aesthetic and conceptual value of using scanner material, Japanese law – as I understand it – prohibits the recording of these signals. Back in the UK, I started to do some web research, finding some fantastic sites devoted to airband, including one where digging deep into the architecture revealed a pristine and compelling recording of Narita tower talking down a number of planes. Even if I only ever use it as a private eavesdropper into a normally inaudible component of the Narita soundscape, I’ll be buying a scanner for the spring trip. Rupert came across an incredible Terminal Control Area (T.C.A) Chart for Tokyo / Narita which represents a fascinating re-mapping of the territory. Cities and road networks are present on the foldable paper TCA Chart but with diminished graphic authority. Contour lines and spot elevations achieve more prominence and terrain height is further indicated by “maximum terrain elevation”. Maximum terrain elevation is represented by double-digit numbers, displayed with the first number twice as large as the second, in a font that looks like it had its origins in block printing equipment. Near the contours of the 7310 foot high Shibutsu-San mountain, for example, you can see the symbol for the maximum terrain elevation of “75”. I assume that this is designed as a quick reference for pilots to rapidly ascertain geographic height. Much of the physical and (to a lesser extent, human) geography of the map is overlaid by geometric lines, arrows, cross-hatching and written legends indicating flight departure and arrival routes, details of aerodromes (whether they are private, public, civilian or military, if the runways are hard-surfaced or unpaved, how high above sea-level they are, how long, what frequencies the control tower and ground control operate on), information about radio navigation aids and the designation of restricted airspace zones. To a map fiend like me, it’s absolute cat-nip. I shot this video on my tiny Flip camera while out on the terrace of Terminal One at Narita Airport.